I’ve made it clear that I love sunflowers before…. in fact, one of the photos I’ve long used for avatars on social media is of me surrounded by sunflowers. They are incredibly picturesque. I have friends in Memphis who get photos in front of sunflowers in full bloom each year. But I have to wonder how many of us stop to think about more than how beautiful they are at times. That was certainly what I was thinking about the day I visited Mark Rohrich (Twitter’s @sunflowerfarmer) in his hometown of Ashley, North Dakota. Later we were able to catch up with his girlfriend Jenny too (you can see a salute to ND sunflowers on her blog too)! So what besides getting photos of beautiful sunflowers (and a great time with friends) did I get from my evening in Ashley? Well, the first thing I learned is that like all farmers, Mark had to inspect the crop closely. And I had never seen that! The flowers almost always, when they are at peak color have lots of bees on them. The well, the part farmers are interested in are the seeds underneath that pollen. You can see in the above photo on the right, Mark is just brushing the pollen off with his hands. Once that happens, you can see the sunflower seeds really clearly. And Mark pulled a few of those to inspect them as well! 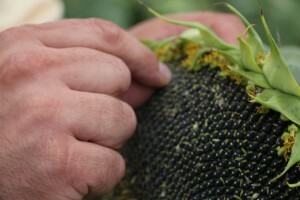 If the bees have done their job pollinating each individual seed, then the seed coat turns black. 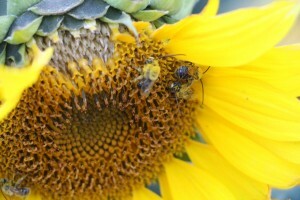 What are sunflower seeds used for? 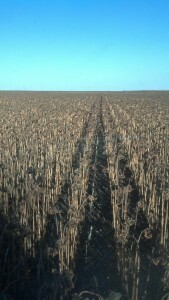 The fields Mark showed me were being raised for sunflower oil primarily. Those seed have almost a totally black seed coat or shell on them. Some of these may be used for birdseed too. That’s when Mark helped me understand that the shells differ by variety. There are different varieties raised to provide sunflower seed snacks for baseball players, kids and folks like me enjoy munching and they are considered confectionery seeds — and yes, they tend to have a white stripe when matured. Cool to know these too can be used to feed birds! In-shell sunflower seed — It is roasted and salted in the shell to be eaten as snacks. Kernel — It is used as snacks, salads, and ingredients of many food products. 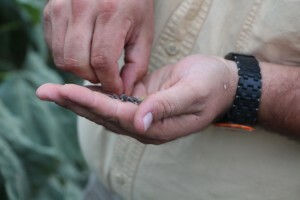 Small Kernel — Mainly used for bird seed. I was there at the right time. The sunflowers were really beautiful. 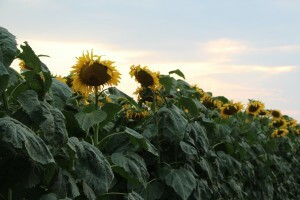 Previously I had seen acres of sunflowers, but there were always other crops easily within sight. The North Dakota prairie seemed to stretch on forever though with so much of the area in around Ashley planted to sunflowers. They are rotated with other crops so there are breaks of corn and soybeans, but there was a greater concentration of the crop than I’d been around before. To me, it is a little hard to think of sunflowers drying down for harvest.I haven’t been around many sunflower fields and I’ve never been in one at harvest. Talking to Mark and knowing that all the other oilseed crops are dried for harvest, it really seemed logical. 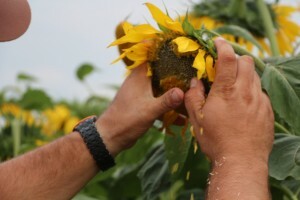 However, seeing Mark share photos of ugly brown sunflowers being harvested, it made me do a double take! 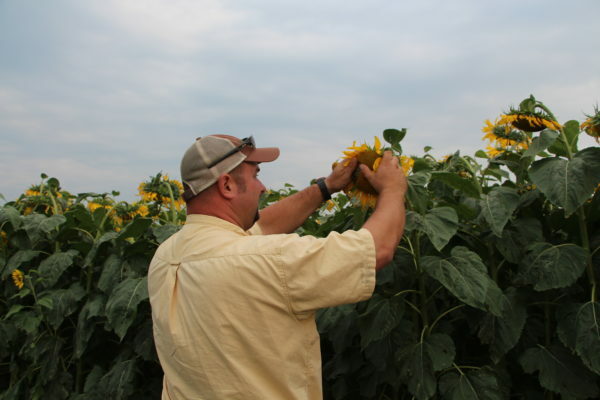 That’s a very cool look at sunflower farming. And it’s important to me, because I’m allergic to peanuts and rely on sunflower butter to fill that craving! But I have been unable to convince Reese’s to fix me up with some sunflower butter cups. Probably for the better, I suppose…. LOL! I love that! If I hear about it, I will certainly let you know. Love this post! Great write up about one of the things we hold near and dear to our heart! Once I am finally feeling alive again, I have a few more harvest blogposts to write and one of them is harvesting sunflowers! It’s totally eerie out there, who would have thought that these beautiful plants would turn so ugly! Thank you so much for making in stop in Ashley to visit us! We had a wonderful evening with you and look forward to spending some more time with you in the future! Another post you need to write is on some of the nutritional information. 🙂 I have folks really interested in it! They face during the night? I would assume they faced west at 12:01am. What so you think? Good question… I think they face west through the evening but I’ll get my sunflower guy to let us know for sure! The sunflowers turn from east facing to southern facing here during the day. Never completely turn west. They regain position during the night to face east once again for the sunrise!